Learning about a century and a quarter of English football history is quite a straightforward business. There’s a clear lineage: the great majority of the clubs involved in the early days of the English game are still around today; most play under the same name, sport the same colours and are based in the same towns or cities in which they were first inaugurated. The only wildly variable element over the decades has been form, something every flourishing League needs for variety anyway. Now try to repeat the same historical process with Belgian football and see what wormholes it will lead you down. The Belgian club scene has a devilishly complex and convoluted past, one littered with perpetual financial crises and a merger culture rather too amenable to throwing out the old and ushering in the new at every possible opportunity. This readiness to dissolve clubs that have made valuable contributions in the past to the Belgian game shows a scant regard for the value of history and narrative that every strong football League needs. Leagues need their faded giants of the past. While these once successful clubs from decades past might have been long overtaken by progress and new-monied arrivistes, their emotive names and past achievements ensure they remain enshrined in their nation’s footballing folklore. It’s history that’s not easily or quickly created. Winners of eleven Belgian national titles in the first half of the last century, the Brussels club Royale Union Saint-Gilloise has such a status in Belgian. That this is a club which has not been competitive since the 1950s doesn’t really matter. Venerable institutions like Union Saint-Gilloise don’t have to achieve, they just have to be to maintain that perpetual umbilical link connecting the earliest days of the Belgian game through to the contemporary era. The problem for Belgian football is that there are too few clubs like Royale Union Saint-Gilloise left. Over the years a willingness to concertina smaller clubs into one another on the assumption that manufacturing something potentially bigger automatically makes it potentially better has left a substantial tear in the fabric of the Belgian game. This is a country in which six former national champions with 26 titles between them no longer exist in anything close to their original form. Occupying a top five position in UEFA’s European coefficients, as recently as the 1980s the Belgian League was one of the strongest in Europe. The elite trio of Anderlecht, Club Brugge and Standard Liege reached European Finals, but there was also real value to be found in the second tier of clubs beneath them. Some might not even have been full-time but were still capable of punching above their weight domestically and in European competition. Some examples: modest semi-professional Beveren winning two titles and two cups in just five seasons and knocked Internazionale out of the Cup Winners Cup. Waterschei-Thor reached the semi-finals of the Cup Winners Cup in the year Aberdeen won the tournament. Their local rivals Winterslag dumped Arsenal out of the UEFA Cup in 1981-82. Lokeren spent ambitiously and were particularly known to Scottish and Danish fans as the club of international midfielder Jim Bett who played there alongside a young Preben Elkjaer. Later in the decade a well-financed Mechelen would win the Cup Winners Cup and gave Arrigo Sacchi’s mighty Milan side a real scare in the European Cup the following season. Even a tiny club like Seraing, traditionally the third club in Liege, could manage occasional top five League placings while fielding recognisable players like future Tottenham striker Nico Claesen and Peruvian legend Juan Carlos Oblitas. Then there was tiny Racing Jet Brussels who fielded the Romanian and 1986 European Cup winning legend László Bölöni. YELLOW: Indicates a club that maintains its previous identity but has, at some stage, gone bankrupt and/or lost its professional licence because of financial problems. RED: Indicates clubs that have been wholly or partly dissolved, typically by being subsumed into a new club as part of a merger. The results are staggering. More than half (19 from 34) of the clubs – and including that year’s national champions – do not exist today in the form they did less a quarter of a century ago. And for all the effort expended upon merger after merger, it’s hard to make a case that Belgian football has actually benefitted structurally or competitively. 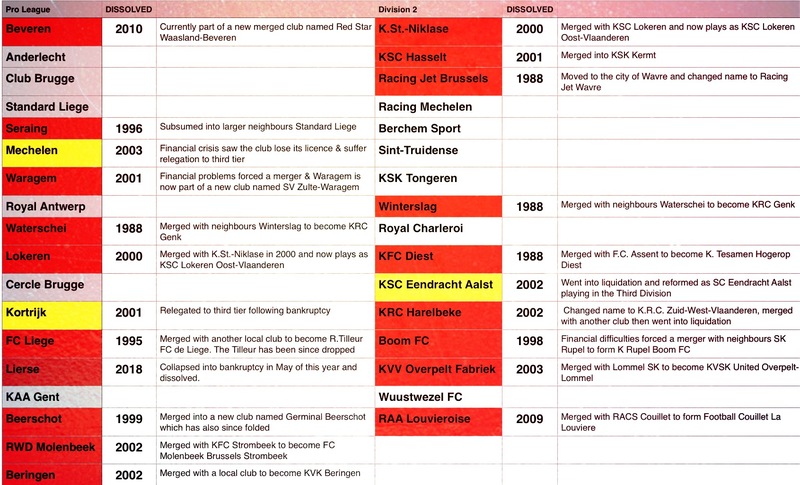 The coming together of Waterschei and Winterslag in 1988 to create K.R.C. Genk has been the only definitive success with the new club going on to win three titles and play in the Champions League in the intervening years. Others might argue with some justification that the loss of two fine old clubs with 133 years of combined history was a high price to pay, just to create an entity that can give Anderlecht the occasional tough game. While bemoaning the loss of so many of the Class of ’84, I’m conscious there could be an accusation of double standards here. I regret the demise of the Brussels club RWD Molenbeek because this was a briefly successful club that actively contributed its own chapter to the story of the Belgian game, but this too was another Frankenstein’s monster of a club, formed as recently as 1973 through an uneasy merger of three other Brussels clubs that included the storied Racing and Daring clubs, winners of eleven national titles between them. Their extinction was arguably more costly to the heritage of the Belgian game than the later demise of the club they spawned. When you see the success of a relatively new merged club like Inverness Caledonian Thistle in Scotland, it does suggest that sometimes a freshening up of a League’s club base can be a positive thing that doesn’t unduly affect its integrity. Belgium is an object lesson however in just what can happen when such a culture runs out of control, unchecked and unchallenged. I once posted a light-hearted tweet suggesting that we’re likely only a generation shy of a dystopian future when Belgian club football consists of a single club, one we’ll call FC Belgium. 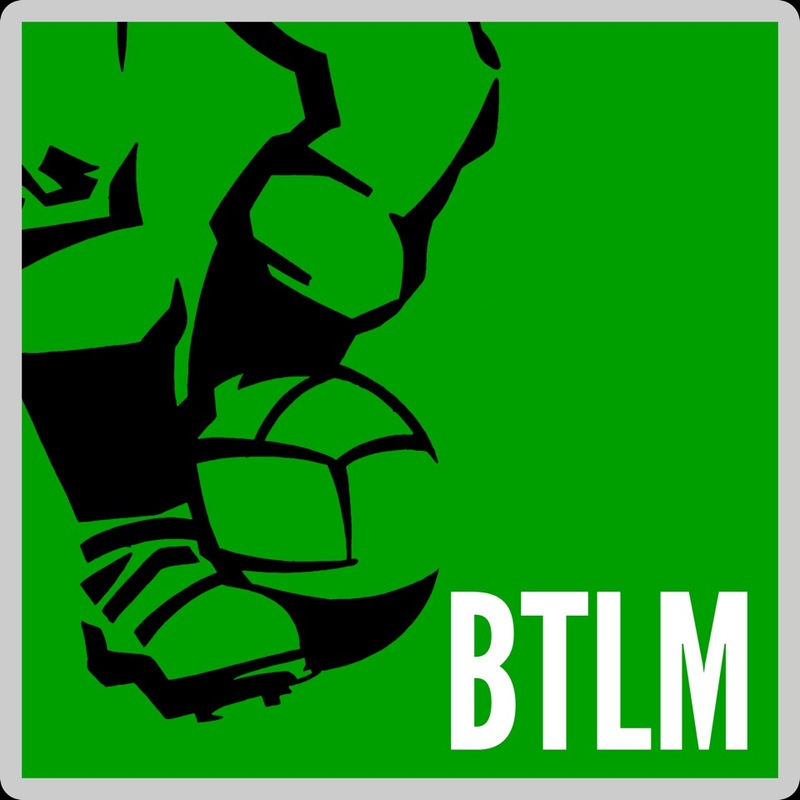 This new creation would be an amalgam of every current Belgian club in existence and would represent the country’s merger culture taken to a logical, if extreme, conclusion. Let’s hope it remains a throwaway jibe rather than a deadly accurate projection of the future direction of the Belgian game. Last year while reading a bit to keep updated U discovered something similar happened in Luxembourg too over the last 20 years. Absolutely great reading. Remember those days very well! Loved the spooky atmosphere and the dirty piches in Belgium. Please check out my Mechelen story on my blog – although it’s in German. Thank you and keep on writing.